October 11, 2012, Woodstock, IL — Newer Technology, Inc. (NewerTech®) http://www.newertech.com, a leading developer of Macintosh®, PC, iPod®, iPhone®, and iPad® performance upgrades and accessories, today introduced the miniStack® Classic powered hub external storage solution. Designed to match the footprint and appearance of 2005-2009 Mac® mini computers, the miniStack Classic also complements any Mac or PC by providing up to 4TB of storage/backup capacity while conserving desktop workspace. An integrated three USB 2.0 port powered hub further reduces clutter by providing a convenient way to connect and charge cellphones, tablet computers, digital cameras, and other USB-equipped devices. Stackable Design Back by Popular Demand Originally debuting in 2005 as the MacAddict Editor's Choice, Macworld Top Product, and 123macmini Accessory of the Year, the Plug and Play miniStack storage solution was redesigned in the form of the new Classic model to meet customer demand. The new model offers the same appeal as previous models: a combination external drive and powered hub with connection flexibility, expanded storage capacity, and unmatched user convenience. Users can choose between FireWire® 800/400 and USB 2.0/1.1 interfaces for data transfer speeds up to 100MB/s. With up to 4TB of capacity and 7200RPM drive speeds, the miniStack Classic is built for the high-performance demands of storing music, photo and video libraries as well as acting as a boot drive. Users can even create a 'power tower' of storage capacity by stacking two or more miniStack Classics while still preserving desktop workspace. With its multi-interface flexibility and stackable design, miniStack Classic is the ideal portable external hard drive storage solution to move among multiple Macintosh computers and laptops and virtually any Windows® or Linux®-based computer with a USB or FireWire port. It can also be added to an Airport Extreme® wireless network via USB to wirelessly share files, perform Time Machine® backups, and share other devices like printers. Plus, miniStack Classic is A/V rated for high-performance home entertainment systems and sharing content with Apple TV®. "From the very beginning, miniStack was immensely popular among Mac mini users," said Grant Dahlke, Brand Manager, Newer Technology, Inc. "Those same users, as well as other computer users seeking maximum storage capacity and desktop organization, spoke loud and clear that they wanted us to continue offering this unique footprint design." Featuring five pre-configured solutions from 500GB up to 4TB, as well as two 'add your own drive' enclosure only kits, the Newer Technology miniStack Classic is available from retailers and Newer Technology's exclusive distributor, Other World Computing (OWC®) starting from as low as $67.99. 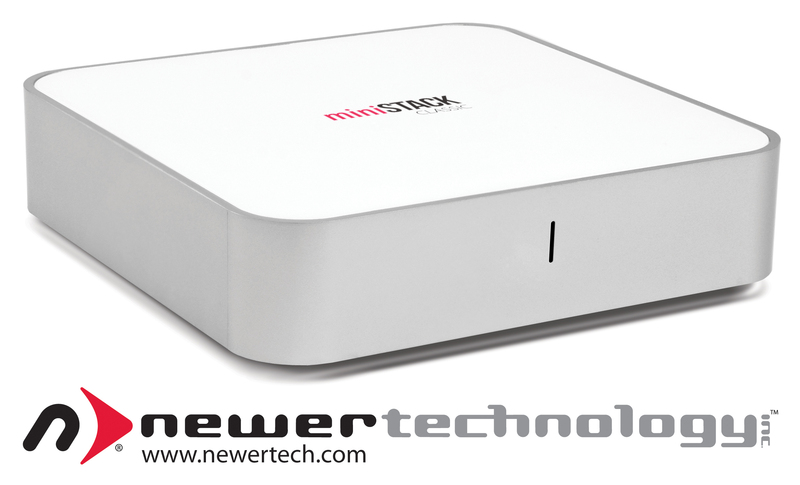 For more information on the miniStack Classic and reseller inquiries, visit: http://www.newertech.com/products/ministack_classic.php For more information on Newer Technology's complete line of accessories and upgrades for Macs, PCs, and iOS devices, visit: http://www.newertech.com.